Summary: Little is known about the early life histories of Atlantic sea turtle species, including the green turtle (Chelonia mydas). Our understanding of early life history, including behavior, habitat utilization, dispersal, and survivorship, is largely inferred rather than directly observed or quantified. We developed tag attachment methods and started to field-test small-scale solar-paneled “bird tags” on lab-reared neonate loggerhead sea turtles in 2009-2010. 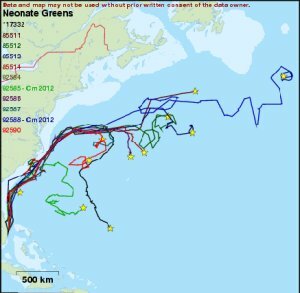 These tags are newly adapted for a marine environment and have the potential to broadly identify neonate nursery areas and to help quantify the dispersal patterns and offshore movements of Florida's neonate green turtles. To expand this research project, we will further refine and ground-truth tag attachment methods on lab-reared neonate green turtles and evaluate the performance of these tags on this species that may behave differently than loggerheads when in the wild. This study will provide the foundation for a continued research effort that will broaden sample sizes and include other sea turtle species and small marine organisms. Results: The shell of neonate green turtles differs from that of loggerheads in shape and surface properties. Unfortunately, the acrylic-neoprene-silicone tag attachment method described by Mansfield et al. (2012) does not adhere to small green turtles. Thus, we initiated tag attachment trials with the 2011 year-class of green turtles. We tested a variety of substances to better prepare the shell for tag attachment, and tested a variety of flexible glues for holding the tags on the carapaces. We were able to combine funding from three different grants to purchase a total of 10 tags to deploy on neonate green turtles. These tags were purchased during the spring of 2012; this grant contributed towards ~4 tags (with the bulk order we were able to get a discount; tag quotes and invoices are attached per our deliverables). Using small, solar-powered Microwave Telemetry 9.5g satellite tags and our new tag attachment method, we satellite tracked 11 neonate green sea turtles (15 to 18 cm straight carapace length) in 2012. Sea turtles were lab-reared, weighed between 500-860 g and ranged in age from 6-9 months post-hatching. All turtles were released in the Gulf Stream off the southeast Florida (USA) coast proximal to their natal beaches. Turtles traveled 475 to 3,500 km minimum distance post-release (Figure 1). The average duration of tag transmissions was 67 d (range: 10-102 d).